Filaments can cause all sorts of headaches for wastewater operators such as foaming and bulking. These problems can lead to violations in effluent limits and less efficient treatment. Bulking problems cause extra sludge hauling expenses and the addition of polymers to control filamentous bulking is often expensive due to the high cost of polymers and the low efficiency of polymers on filamentous bulking. Foaming leads to extra labor controlling foam by spraying water or adding defoamer, and often leads to the unpleasant task of cleaning up filamentous foam to maintain sanitary conditions and to avoid operational problems. It is important to note that there are many more filaments that can appear in wastewater than are included in this guide. It can also be difficult to identify these filaments because identical species tend to vary in shape, size, and other distinctive features due to plant conditions. This guide will cover the environmental conditions which can lead to filamentous growth, as well as the physical characteristics of most commonly occurring wastewater filaments. We will also cover how we use each filament’s environmental preferences to create an effective way to limit the growth of these filaments in wastewater systems. If you experience problems from any of these filaments call us at 1-888-757-9577 or visit our Lab Services page. We will work with you to resolve the conditions. 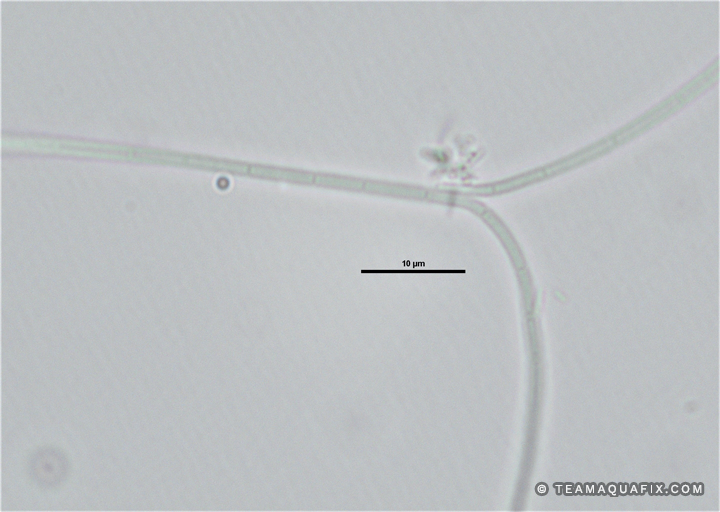 M. parvicella is usually a very distinctive filament in wastewater treatment. This is due to its spaghetti-like appearance under Gram stain. It stains strongly Gram positive and contains Neisser positive granules. 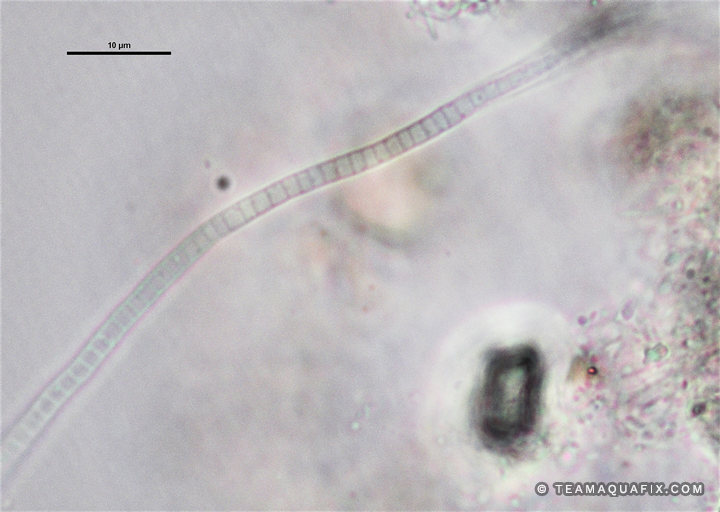 M. parvicella tends to thrive in cold temperatures with high fats, oils, and greases (FOG). M. parivciella floats in water due to the high concentration of low density fats present in its cell wall. These filaments form a tangled mat on the surface of aeration systems which effectively traps air from air diffusers leading to foam formation. While M. parvicella is known for forming a thick layer of dark brown scum up to around 6 inches, M. parvicella can lead to foaming of a variety of colors and consistency’s and therefore must be identified microscopically before an effective treatment can take place. M. parvicella foaming can be controlled effectively through the addition of Foam Buster and Qwik-Zyme L while increasing sludge wasting. Foam Buster provides a blend of proteins, amino acids and micronutrients which allows wastewater floc forming bacteria to better outcompete filamentous bacteria in conditions with high levels of incoming FOG. Qwik-Zyme L catalyzes and degrades fats, oils and greases to allow floc forming bacteria to more easily out-compete filamentous bacteria such as M. parvicella. 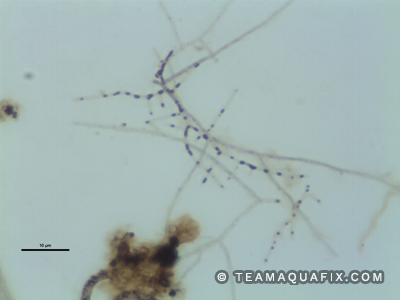 Nocardioforms, or “Nocardia”, are typically easy to identify in wastewater because of their true branching, Gram positive staining, and Neisser positive granules. True branching means one filament continues to grow in multiple directions, like the growth of an oak tree. Nocardiforms, like M. parvicella produce a low density fatty cell wall which causes them to float on the surface of water. This in combination with their generation of surfactants during growth, and their formation of a thick mat due to branching causes them to typically form very stable foam that can be several feet thick. It is important to note, that while Nocardiforms are known to produce a very thick stable foam, they also can form thin layers of scum which means you cannot definitively identify “Nocardia foaming” without microscopic observations to identify the filament in the foam. Nocardioforms can be controlled with the addition of Qwik-Zyme L, and Foam Buster to favor floc forming bacteria over filaments, and through increased wasting to reduce sludge age. VitaStim Low F:M can be used to rebuild bacterial populations after increased wasting. 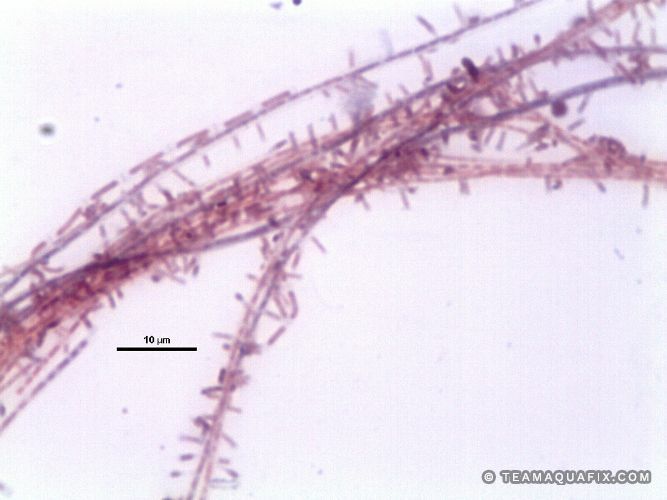 S. natans and Type 1701 are relatively common bulking filaments. These filaments are likely the same filamentous species responding to slightly different environmental selectors. 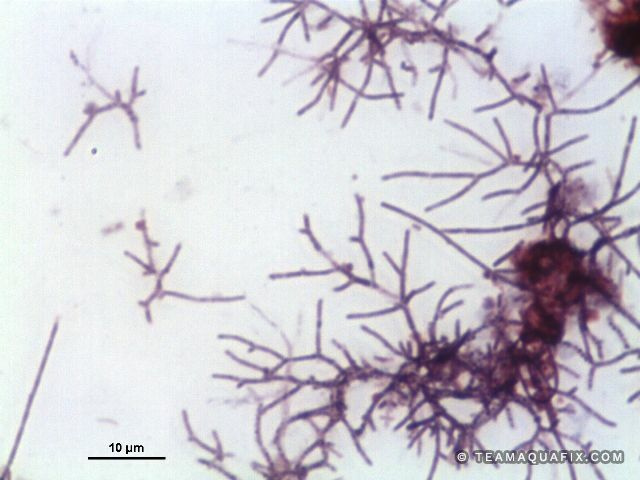 These filaments are typically distinguished due to false branching characteristics in the case of S. natans and the presence of attached growths in Type 1701. Both filaments have a thick sheath and sausage shaped cells. Interestingly, it is not uncommon to observe attached growth and false branching at the same time in these filaments making the distinguishing feature between these filaments not very helpful. 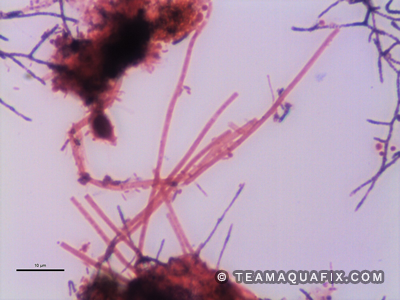 Fortunately, these filaments thrive in nearly identical conditions with high flow rate, low DO, and septic compounds. 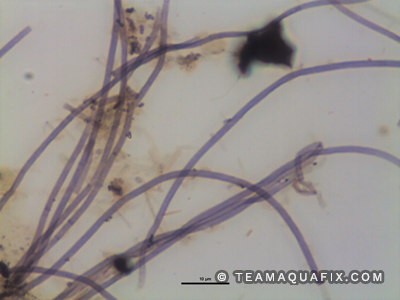 These filaments most often grow upstream from a wastewater system in a sewer line or lift station. These filaments are effective at anchoring themselves to the side of a sewer line but will occasionally break off due to changes in flow rate, very high populations, or routine sewer line/lift station cleanings. 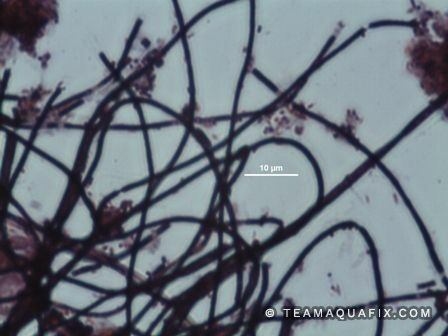 When these filaments enter a wastewater plant, they can cause long term bulking problems in plants even in conditions that are unfavorable to their growth due to the strength of their sheath. In fact, the sheath of S. natans and Type 1701 can remain in a wastewater system long after the filament itself dies, continuing to cause bulking problems. Due to these characteristics, the only effective way to prevent the presence of S. natans in a wastewater system is to prevent its growth upstream. This can be done by more frequent sewer cleans, nano-bubble diffusion upstream, or by metering in OxyFresh, particularly in weeks prior to sewer cleanings or conditions that could increase flow rate such as snow melt, or heavy rain. Thiothrix/Type 021N are thought to be different forms of the same filament. The Type 021N form is more prevalent in nitrogen deficient conditions and Thiothrix tends to be more observed in low DO, septic and sulfur reducing conditions. Type 021N tends to have disk shaped large cells, and Thiothrix usually has rectangular cells which sometimes contain sulfur granules. 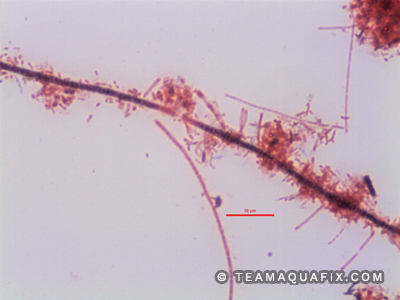 Both filaments stain Gram negative but can contain granules which stain Gram positive. Occasionally these granules can be present in high enough levels to make the staining identification difficult. These filaments can be controlled by our Filament Buster in a wastewater aeration system as well as the addition of OxyFresh to regions of a wastewater plant with low DO, and whenever septic waste is added. Filament Buster provides a balanced source of nitrogen which is rediably available to floc forming bacteria to allow them to outcompete low nitrogen filaments. OxyFresh increases wastewater plant ORP to help limit septicity in low DO conditions. Type 1851 is a Gram positive (or Gram variable) filament that is relatively easy to distinguish due to its rectangular cells, attached growths and tendency to form bundles when populations get high. Generally this filament is caused by low F:M and is easily controlled by addition of our SmartBOD in addition to increasing sludge wasting. Type 0041/0675 are slightly different forms of the same filament. 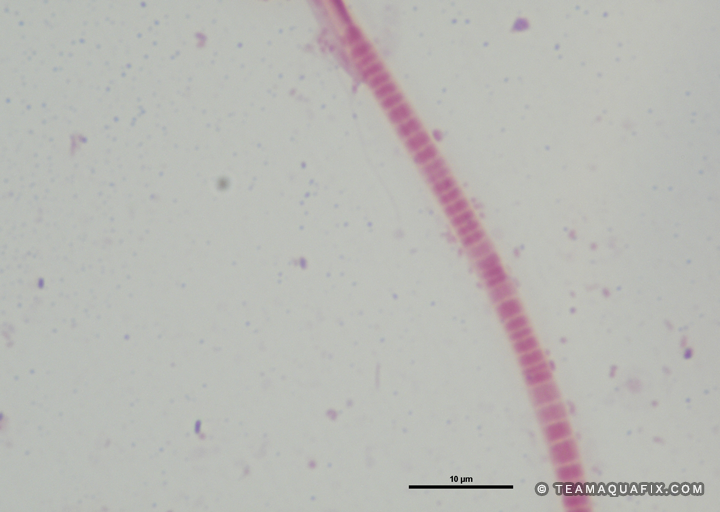 Type 0675 is usually slightly thinner than Type 0041 but both filaments stain Gram positive (or Gram variable), contain square shaped cells, and generally have high levels of attached growths present. These filaments generally do not cause major problems but occasionally increase in prevalence in mild Low F:M conditions which can lead to bulking. 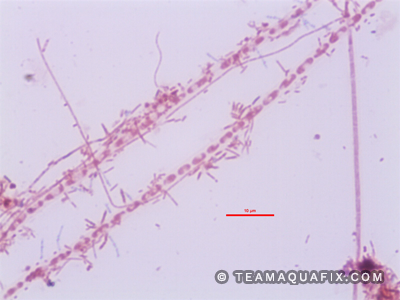 These filaments can be easily controlled by the addition of SmartBOD in severe cases, and by the addition of VitaStim Low F:M.
Type 0092 can cause bulking problems in aerobic wastewater systems but is an important precursor to foaming caused by M. parvicella . 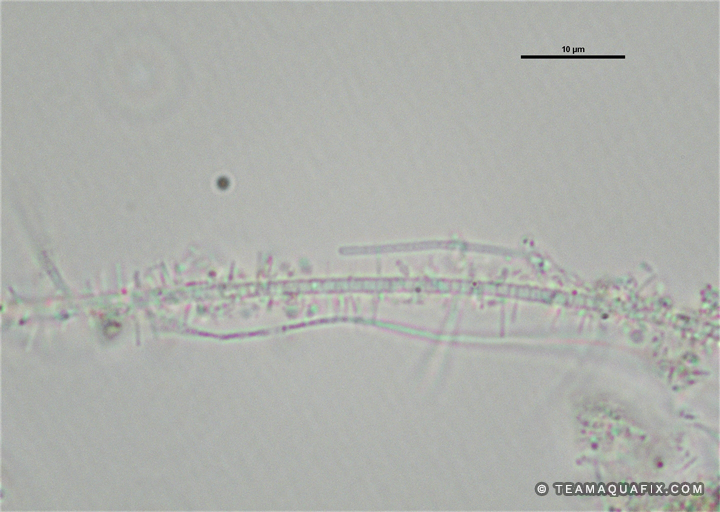 Type 0092 thrives in conditions with very similar food sources to M. parvicella but in warmer weather conditions. This filament’s cells individual cells are difficult to see as they are normally contained within floc, but the filaments tend to be fairly straight or slightly bent in shape. 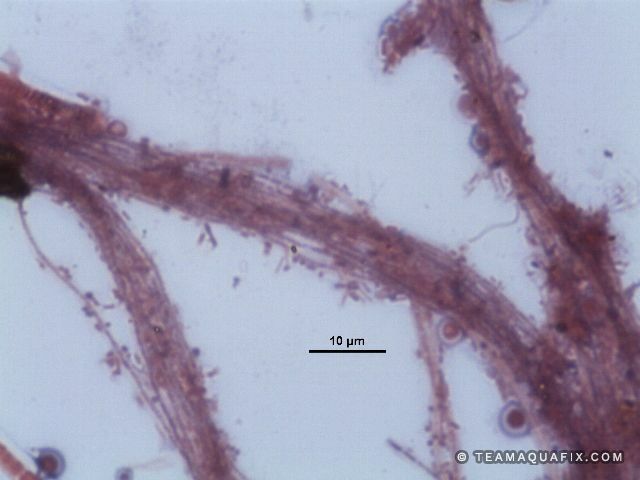 These filaments have a sheath which stains a very distinctive blue-violet after Neisser staining. Due to the similar food requirements of Type 0092 and M. parvicella, they tend to trade prevalence when the weather gets warmer or cooler. 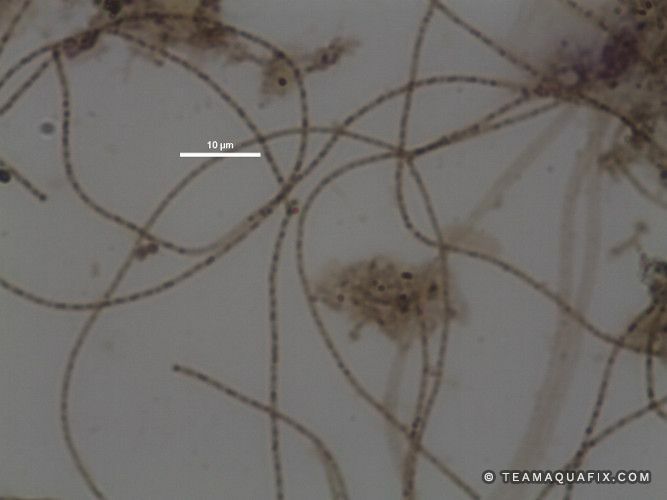 Therefore, if you observe Type 0092 in high levels in the fall, you are very likely to see the population shift to high levels of M. parvicella as the temperature cools in a wastewater system leading to foaming. Also, if you typically observe M. parvicella in the winter, you are quite likely to see the filamentous population shift to Type 0092 as the temperature increase which will sometimes lead to bulking. Type 0092 Can be controlled by similar the same methods to M. parvicella . Typically the addition of Qwik-Zyme L upstream from a wastewater system and the addition of Filament Buster in a wastewater aeration basin are effective for the control of this filament. These products help to allow floc forming bacteria to outcompete Type 0092.